Dr. Thomas H. Troeger, Ph.D, Yale University, presents the 2014 Pfautch Lectures on Monday, October 20 at 7pm, and Tuesday, October 21 at 7pm at Second Presbyterian Church in the Central West End. The lectures, Song That Blesses Earth, are co-hosted by American Guild of Organists – St Louis Chapter, and Kirkwood Baptist Church, and consist of two different lectures. Dr. Troeger will present “Song That Deepens Faith” on Monday, Oct. 20. The topic of Tuesday’s lecture is “Song That Wakens Hope”. For more information please visit secondchurch.net. 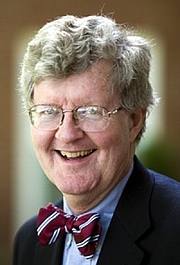 Thomas H. Troeger is currently considered a "single author." If one or more works are by a distinct, homonymous authors, go ahead and split the author. Thomas H. Troeger is composed of 1 name.